Marybeth and Paul are a couple of busy animal loving attorneys who already own a dog and a cat. 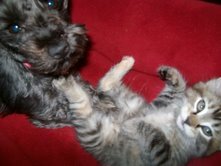 Marybeth would like to add another dog to their family to help their current toy schnauzer, Olive, relax. Paul argues that with their busy schedule, and the already antsy Olive, another dog would only exacerbate the situation. Will the Judge mandate they double down on their puppy love, or will he send this idea to the dog pound? Find out on this week’s Judge John Hodgman. A video of Olive's first Christmas. And a photo of Olive and the cat together. Great podcast, as always. I was especially glad to hear in your ruling that the additional dog must be a rescue dog. If they are interested in getting a greyhound, I would suggest they check out greyhound rescue http://www.runforadoptionmt.org/. Great organization that gives these beautiful animals loving homes. While listening to the podcast, I became very excited to "view the evidence" and watch the cat/ping pong video. To my embarrassment, I had already seen this video! I spend too much time at work watching dog and cat videos on Youtube. I am a terrible employee. Thank you, Judge Hodgman and Bailiff Jesse. Your podcast is a joy. Bailiff Jesse's crack about how, in all fairness, having your manhood compared to a greyhound is not all that bad because after all they "like to cram into small spaces," was completely under-appreciated. It deserved a chuckle, if not a guffaw. I, too, laughed out loud at this comment about the comparison of the manhood and Greyhounds both liking to fit into small spaces. A nice bit of quick and clever humor - my favorite kind! It makes perfect sense that the law offices of Montana would be so dog-friendly. I'm sure many of these pooches simply follow their masters into town when they ride their horses in every day; and lazing about the office is a healthy alternative to fighting packs of coyotes for scraps tossed out onto the dusty, wood-planked streets. Wow, two podcasts with people from Montana. I feel kinda left out. I feel compelled to find someone I have issue with and somehow get our case heard lol so that I can make it 3 cases from MT because as Schoolhouse Rock has taught us 3 is a magic number. I <3 this podcast, I look forward to every episode. Thank you Judge Hodgman for requiring a rescue dog in this case! There are so many unwanted dogs who need good homes. I wish you would back track a bit on the "all cats are manipulative" statement. They also have great companion qualities and by a rate of 3-to-1 are euthanized in shelters in comparison to dogs. To the nice couple from Montana, as a former Montanan myself, I'd be curious to know what the first number of your license plate is. Does Montana have a large enough population for the license plates to have more than one letter/number? I guess this doesn't matter from an anonymity/privacy perspective though, as Paul and Marybeth are already well known as the only two people in the state to be under the mandated pet minimum. Montana license plates have the county code as the first 2 digits in the plate number. My other half is from Montana, and every time we see a plate from there, he says the county out loud. I always found it a little strange, but a little funny. I tracked them down...it's 7! Oh sweet podcast show! Thank you for a new episode. I got my first sweet taste and quickly got hooked months back and now I need the show just to function. Now it seems like there's a drought, with new episodes coming every two weeks. I've been rationing and hoarding episodes to get me through it. Bless you, my man! You brought the candy!